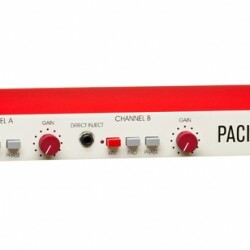 The A Designs Audio “PACIFICA” is a single rack space, dual (mono/mono) channel microphone preamp that comes amazingly close in look and sound to the original Quad Eight consoles. Throughout the1970s, the American professional music recording industry was in its heyday. Popular artists like The Who, The Beatles, The Eagles, The Doobie Brothers, The Rolling Stones, and Steely Dan were all at the top of the charts. Needless to say, the diversity and quantity of new music was amazing. But, the seventies were also a time of great change in pro audio. The introduction of “solid state” electronics led to an explosion in development and a very different sound than the tube gear of previous years. The Recording Console in a high end 1970s studio was most likely a Neve®, an API®, or a Quad Eight. These were the companies that were setting the standards for audio quality with a unique sound firmly imprinted on the popular recordings of the era. While much has been made in our era with Neve and API reissues, interpretations, and clones, the Quad Eight curiously faded from view. Yet many engineers to this day firmly believe that the Quad Eight Ventura, Pacifica and Coronado consoles were sonically the very best of their day. Peter of A Designs Audio in West Hills California and pro audio designer Jon Erickson teamed up to recover and restore this lost “sound” to the recording community. Significant effort went into the research process. This included speaking with Quad Eight owners and chasing down the origins of what was “The Quad Eight Sound”. Closely examining the design and composition of these were both a nightmare and a joy. The original Quad Eight staff was hard to locate, design/parts and documentation was impossible to come by and key parts were obsolete and not readily replaceable. After thousands of hours, endless listening sessions and a ton of time at the bench, a target finally emerged. The Quad Eight mic pres, such as those used in the Quad Eight Ventura, Coronado and Pacifica consoles emerged as the best examples of the unique Quad Eight tonal character. Thanks to critical efforts by Tom Reichenbach of Cinemag (whose father designed the original Quad Eight transformers), Jon and Peter developed a prototype dubbed the “Pacifica” as a clear indicator of its Quad Eight inspiration. This prototype was sent to a handful of devoted Quad Eight Console owners and mic pre fans along with some of today’s talented recording engineers. The results were gratifying: nearly all agreed the new A Designs prototype was very close to the original Quad Eight sound but with a tad more top end! There are a few valuable improvements to the original design including a front panel active hi-z 1/4 inch input that places the input transformer directly in the signal path. The PACIFICA possesses a uniquely “Made in California” feel with a significant heft from the huge transformers contained within. The original cream colored panel and red knob scheme has been retained. The PACIFICA has become an instant classic and added to the list of many engineer’s “must haves” for years to come.